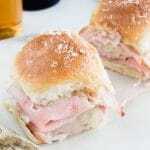 Easy Ham and Swiss Sliders on Hawaiian rolls are the perfect finger food for game day parties. 10 min prep and then just pop in the oven 20 minutes before you are ready to serve! Nothing beats easy foods for entertaining! 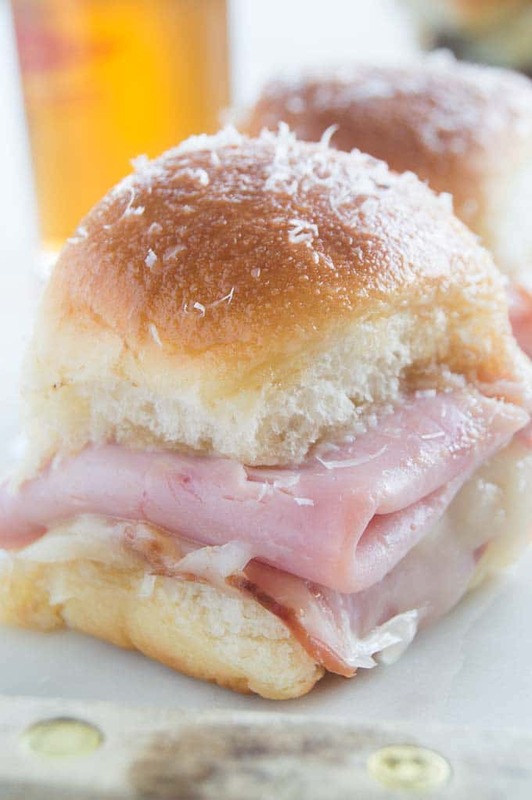 These Easy Hawaiian Ham and Swiss Sliders can’t get any easier and the fact that ham and cheese are perennial favorites will make your game day menu a success! These bite sized treats aka ham Swiss sliders are party sandwiches that are made in one dish. Assembled in a casserole dish or baking tray which you can make ahead and just pop into the oven when you’re ready to eat! They are also a great way to use of all of the leftover ham you might have this time of year! 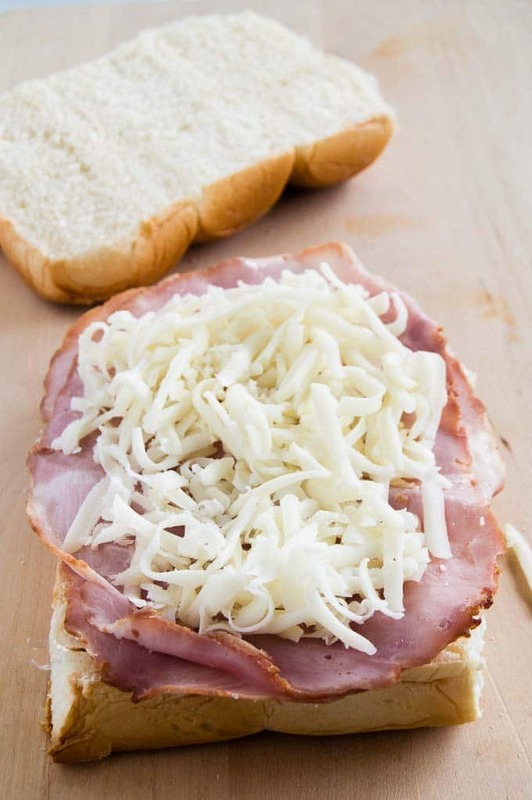 These game day sandwiches are filled with fresh ham and lots of Swiss cheese. 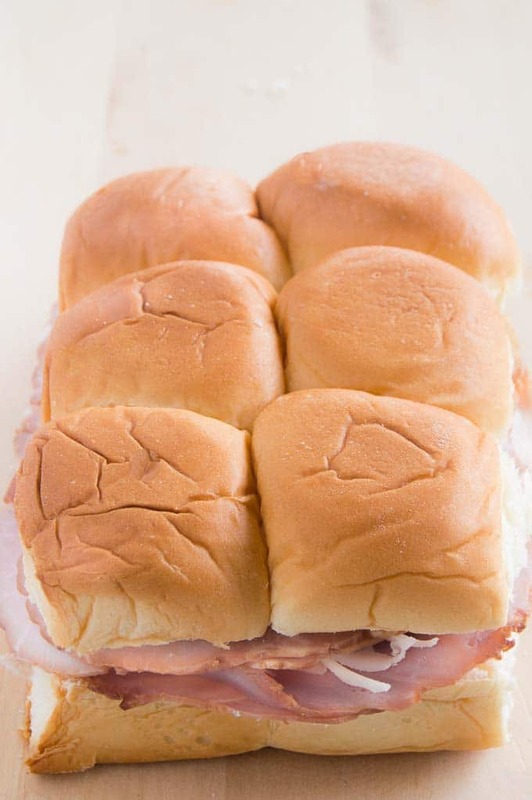 Top that deliciousness with the butter then the buttery Worcestershire mustard sauce that you brush over the top before baking and you get a bite sized game day snack that makes them a step above your average ham and cheese sliders. PIN THIS TO YOUR FAVORITE GAME DAY BOARD FOR EASY REFERENCE!! Buying the rolls in the plastic packages where you have to pull them apart make cutting the rolls for assembly super easy. Our family LOVES Kings Hawaiian Sweet rolls so that is what I used.. But you can use the rolls your family likes for an easy substitute. Assemble the sandwiches in the same bread block. Only cut them after serving them. Note in the photo below this loaf will make six sliders. You wont break them apart until after baking. Then you cover them with the entire slice of tops then drizzle on the butter sauce just before baking! Do I have to use the butter sauce? Well, you dont have to if you dont want to, but the butter sauce makes these ham and cheese sliders . I know if you are watching what you eat you will be tempted to reduce or skip the butter/mustard sauce. It makes the ham and cheese slider. The liquid spreads out and melds all of the flavors deliciously when baking. 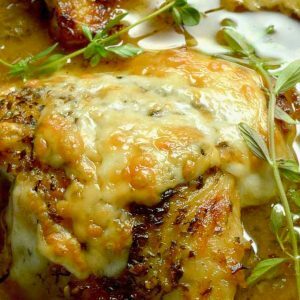 There is a little bit of mustard and Worcestershire in the sauce which add a buttery tang to each bite. 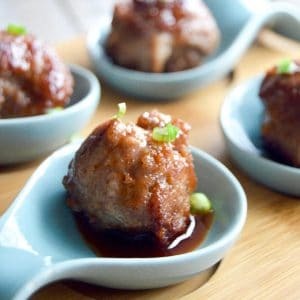 Besides the sliders are so small you can limit the amount but still enjoy the whole flavor of the sauce in each bite! What other rolls or breads can I use to make these sliders? I’m particular to soft dinner type bread rolls, but any soft bread or small roll will work. If you are using rolls that are not still attached, just lay them in the casserole dish close together then assemble them all at once. Do I have to bake these ham and swiss sliders? You can absolutely serve these cold without baking them. If you do that brush the sauce on the inside of the roll before placing the ham and cheese on the bread. You’ll still have a great full flavored sandwich! Can I sub any other cheese for the Swiss cheese? You can use any cheese that you like, preferably ones that melt easily. Cheddar, American, Provolone or Gouda work well. 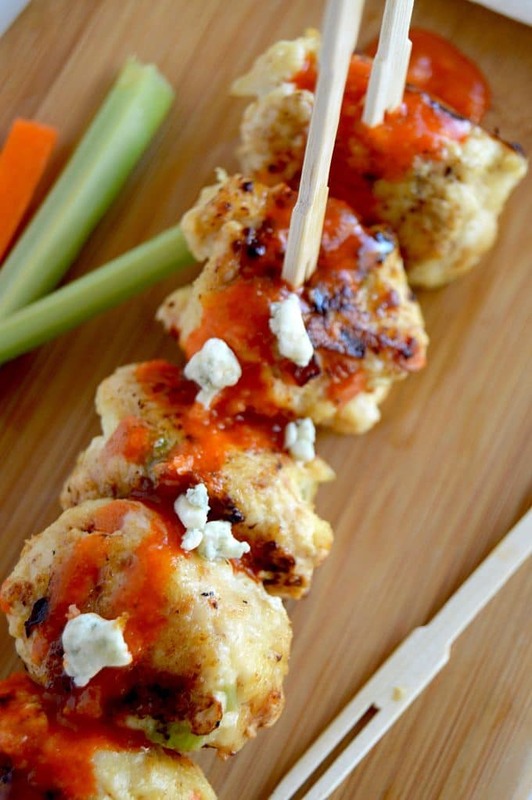 Buffalo Chicken Meatballs ~ low fat, high protein option! 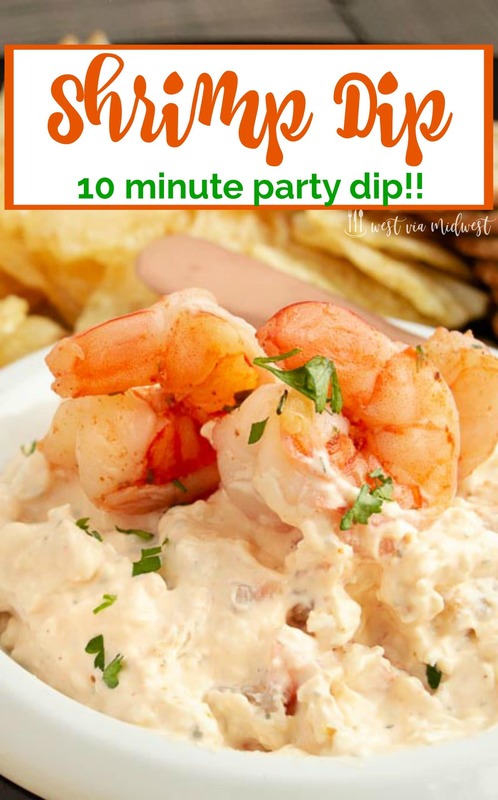 PIN THIS TO YOUR Game Day Food or Appetizer boards for when you are looking for recipe ideas! You can also Follow me on Pinterest to get more ideas to have for making easy delicious meals and appetizers for any entertaining! Remove the rolls from the plastic bag and cut in half for a sandwich. 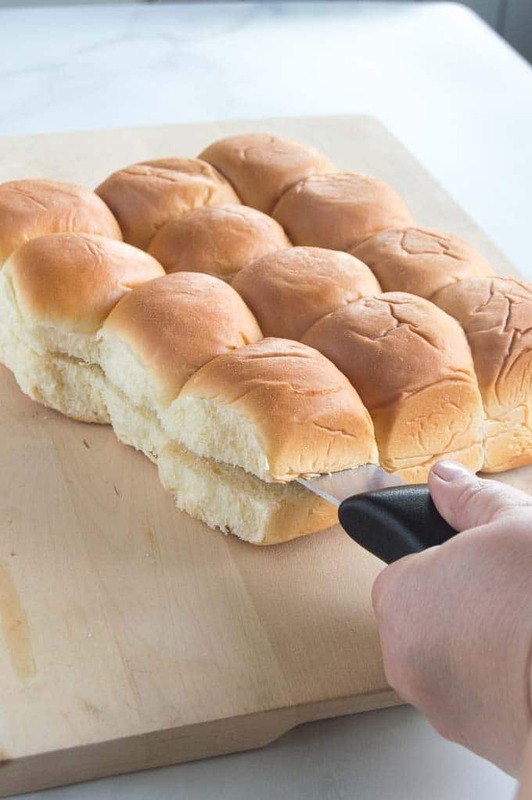 Do not pull the rolls apart, you will be cutting the loaf into just two pieces. Layer ham evenly over the top of the bottom stack of rolls. Then layer the cheese slices (or grated cheese if you bought fresh) over the top of the ham. Place the top of the rolls on top to form a loaf of sandwiches. Place entire loaf into a baking dish. Cover with foil and place in fridge until ready to bake. While oven is heating up, melt butter in a microwave safe glass bowl for 45 seconds. Add mustard and Worcestershire sauce and stir to blend. Remove foil from the top of baking dish. Using a brush, brush all butter over the top and sides of the rolls, using all butter mixture. Recover rolls with foil, then place into the oven (when heated to proper temp) and bake covered for 25 minutes until cheese is fully melted. Then remove foil and bake for 5 minutes more. Remove from oven and allow to cool for 10 minutes. Then cut along individual roll areas to get 24 individual sliders. Serve immediately. My mother-in-law makes something similar and they are always such a big hit! Totally perfect for a game day celebration! I love appetizers like this, so easy and delicious! 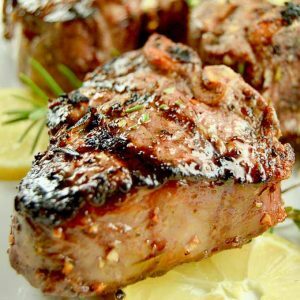 These are perfect for feeding a crowd, and so quick as well! They look so yummy, will definitely be giving them a go! Ham and cheese sandwiches are kind of my go-to favorite lunch so I’m 100% positive I’m going to love these hot, melty sliders! They look fantastic! I could eat like a thousand sliders every day! LOVE these! The ham with the Hawaiian rolls sounds like a perfect match, and I bet the sauce on top makes them amazing! I will have to give these a shot soon. Love these sliders! Perfect for game day! 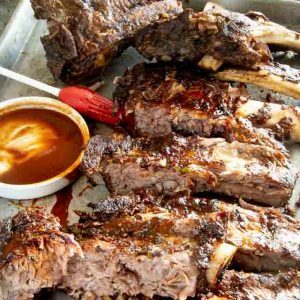 Thank you for sharing this recipe and all your helpful tips! We made the sliders yesterday and they were a big hit!! I love your idea of not pulling the bread apart until after baking! Genius! These sliders look terrific and would certainly be a hit with all!